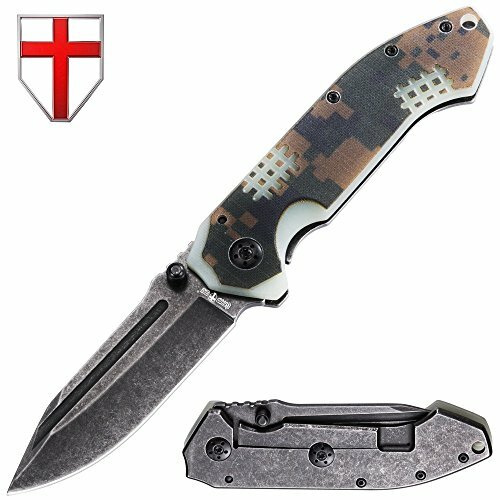 GrandWay 01289 is a folding clip point blade knife of military style made of high quality stainless steel with black stonewash finish. This folder combines a modern technical design and time tested functionality for everyday carry. The blade has stonewashing, jimping and thumb studs which enable one-hand opening. The blade is reinforced with the fuller. The handle of the knife is 2 steel liners connected with screws and remote stack bolts. One side is covered with camouflaged G10 material. Knife comes with a hole in the end of the handle for a lanyard or safety knot. The ergonomic shape with surface grooves provides a very comfortable and stiff grip and is handy for right and left-handed people. The tactical knife has a simple and reliable frame lock. The lock is very easy to handle and copes quite well with the loads. All these features make this model a good option for those who are looking for a reliable assistant not only for EDC use or picnics, but also for quite difficult hiking, camping, scouting, hunting, fishing, other outdoor and survival activities. Such multifunctional knives can be used also to rescue yourself in extreme or emergency situations and will always come to your aid during everyday use. Attractive design and compact size make of this knife a perfect gift for birthdays or any occasion to make nice to your friends, boys and guys. GRAND WAY is engaged in the production and development of projects of knives (folding, hunting, tactical, souvenir, etc., with more than 1000 species) under its own brand for over 15 years. Our goal is to bring together all the best, devised and tested over the years in the knife industry. OUTDOOR FOLDING KNIFE WITH STRAIGHT BLADE AND A LANYARD HOLE FOR EVERYDAY CARRY has a simple and reliable frame-lock that is resistant to dirt and prevents unexpected closure. Equipped with thumb studs for right and left hand opening. PERFECT TACTICAL KNIFE FOR EVERYTHING - Camping, Hiking, Backpack, Bushcrafting, Hunting, Fishing, Military & Army needs, Outdoor & DIY Activities, Survival, Self Defense, Emergencies. BLACK STONEWASHED STAINLESS STEEL - excellent balance of hardness and corrosion resistance ensures proper operation without sharpening. Provides razor sharp cutting performance and high durability. The coating reduces the reflective glare of the blade. ERGONOMIC METAL HANDLE with a camo plastic plate on one side for comfortable and stiff grip. A great utility tool of high quality and sturdy materials for professional and tourism lovers alike. 100% MONEY BACK GUARANTEE - your new pocket knife is protected by Grand Way 10-year warranty. Perfect gift for men or women in your life. If you have any questions about this product by Grand Way, contact us by completing and submitting the form below. If you are looking for a specif part number, please include it with your message.